If your pool has developed cracks in the plaster over the years, you should have the plaster repaired by a pool specialist knowledgeable in pool repair. When the surface of your pool needs attention, you have a myriad of choices for refinishing the surface of your pool. You can select the classic white plaster finish. This type of finish has been around for years. White plaster is a tried and true material for refinishing the surface of a pool. However, new and exiting finishes are also available. Pebble finishes create a rainbow effect and give your swimming pool an entirely new appearance. When you are ready to upgrade or install pool or spa tile, you will have several choices, as well. Pool or spa tile will enhance the beauty of your pool or spa and create a unique look. When you are ready to install tile or your pool or spa finish requires updating, M & J Plastering will offer you a variety of choices for the project. Call M & J Plastering for more information about the services and options we provide. 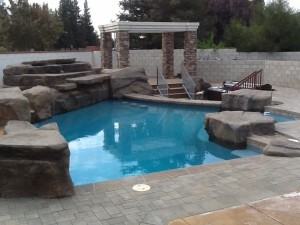 We will work closely with you to design the pool of your dreams. Call M & J Plastering at 661.364.0352 to discuss your plastering, tile and remodeling options.